The next couple of months will be hot days and sultry nights here in Kentucky. It’s hard to image life before air conditioning. A church fan just wouldn’t be enough. My interest in chocolate starts to dwindle around about now and stays in retreat until October. Replacing it as a craving becomes anything citrus, tart and tangy. Especially if it comes in cool colours like lime green. 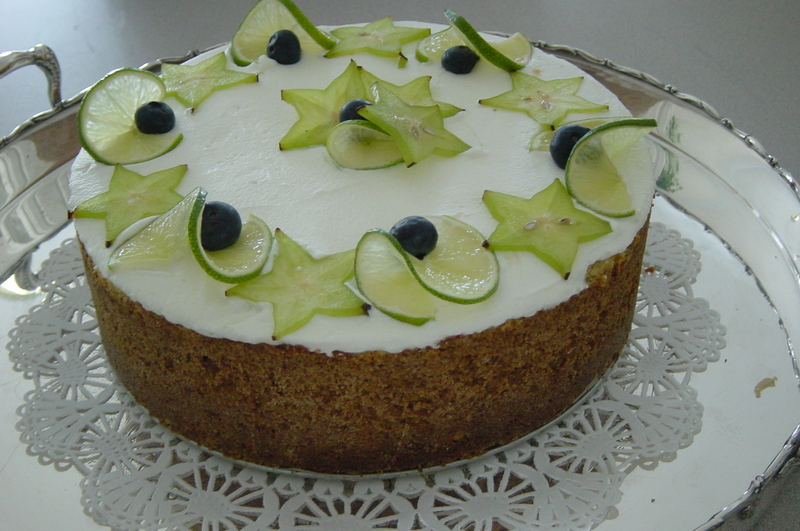 This key lime cheesecake is simply perfect in every way, delicious, visually enticing and cold from the fridge. I chose to decorate mine with lime twists, star fruit and big juicy blueberries. I’ve never had a single crumb left over. the sour cream topping on this cheesecake is a wonderful creamy finish that gives you a smooth surface to work with and decorate, toasted coconut would also be a great garnish and complimentary taste. make the crust: in a bowl, stir together the crumbs and the sugar and stir the butter in well. Pat the mixture evenly onto the bottom and 1/2 inch up the side of a buttered 10 inch springform pan and bake the crust in the middle of a preheated 375 degree oven for 8 minutes. Cool completely. Increase crust ingredients if, like me, you prefer to take your crust all the way up the sides. cheesecake in the middle of a preheated 375 degree oven for 15 minutes, reduce the temperature to 250 degrees and bake the cheesecake for 50-55 minutes more, or until the center is barely set. It will continue to set as it cools. Let cheesecake cool on a rack and chill it covered, overnight. topping: just before serving, beat ingredients together until well blended and spread smoothly onto the cheesecake. Garnish. This looks great and I have a lime tree in my garden. But what are graham cracker crumbs? Digestive biscuits? And how much is a stick of butter?